Without reservation I would call the Cinco de Mayo weekend a perfect weekend. It was a combination of a great location (Santa Fe, New Mexico) + wonderful friends + excellent conversations + sightseeing + shopping + perfect weather + good food + knitting. How can you top that? The weekend was so good, in fact, that I often forgot to take pictures. Does that mean that I should go back again one way, hopefully soon? I think so. 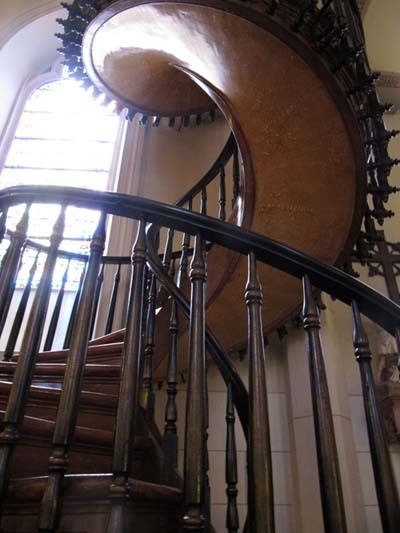 One of the most spectacular things that we saw was The Loretto Chapel with its magnificent staircase. What makes it most impressive is that it was built without the use of any nails...only pegs, by an unknown carpenter. I suggest you click on the link and read more about this special place. Now, this is a coincidence: I flew from Calgary to Santa Fe with a layover in Denver. While in the Denver airport I checked my email and there was an invitation from artist Faith Welsh to all her friends to come and see her exhibit which was the next day in Santa Fe. 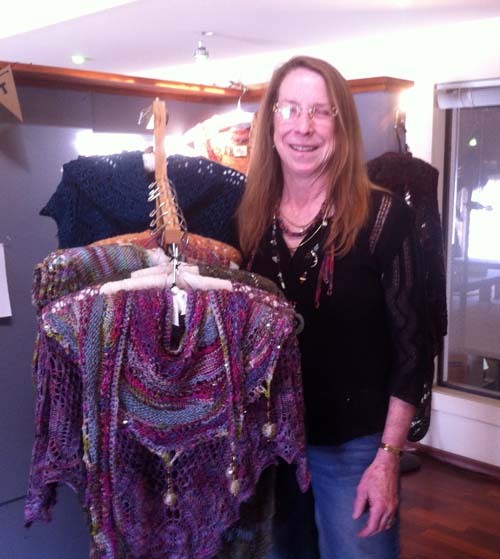 I was lucky enough to meet Faith and visit her studio in Taos last fall. Of course, I wanted to go to see her, and another friend, Ricki Darbee. It was so nice to see them again and this an unexpected bonus during this trip. 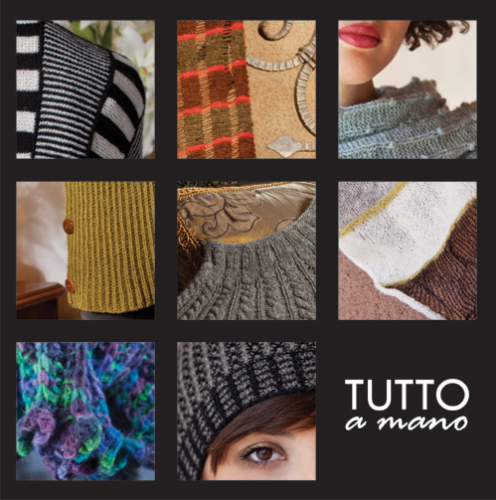 Of course, no trip is complete without a stop to a yarn store and we found a very nice one, Tutto Santa Fe. I like this shop a lot. The owner was welcoming and we spent quite a bit of time looking at every ball or skein of yarn, every button, book and notion. We all left with "souvenirs"!! I wish I'd taken pictures. I saw yarns that I'd never seen before: Isager, Marion Foale, Simply Shetland and Geilsk to name a few, as well as others that I'm familiar with and like. I found yarn that was dyed especially for the shop in southwest colors for my Travel Afghan. More about that in my next post. 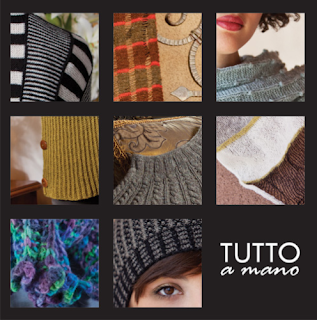 I also bought a book of patterns and articles that was made for and by Tutto, called Tutto a mano. All of us were quite taken with a cabled sweater in the book (in the middle picture, below) and one of us bought the yarn for another sweater (the black and white one in the top left...but she purchased stunning black and turquoise colors). I can't wait to see how it turns out.....Pam. Another coincidence..... I ran into another friend, Sam from Denver, as we were leaving the shop. She was just arriving! As often happens with good vacations, the time went by much too quickly and it was time to go, but with talk of doing this again next year, possibly going to Northampton, Massachusetts to Webs for their annual sale. It doesn't matter to me where we decide to go as long as we can hang out together again. But a yarn sale? Hmmmm...... nice! 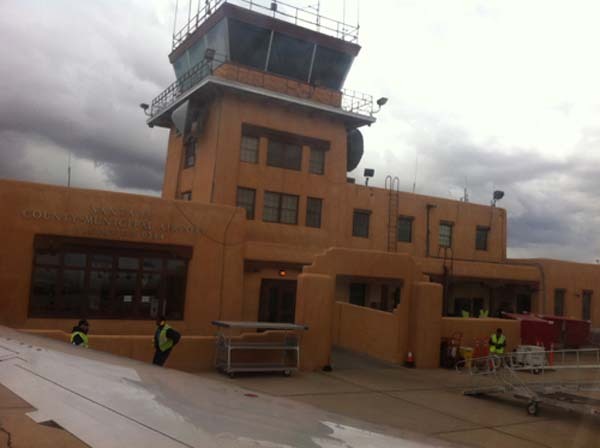 Santa Fe airport from the plane. It was clouding over on the day we left.